New year, new home renovations? Whether you’re getting ready to transform your entire kitchen into a farmhouse-chic dream (hello, shiplap and apron sink!) or maybe just to add some new wood floor for the foyer, it pays to know what kind of return on investment your home renovation might deliver. According to Remodeling magazine’s annual Cost vs. home report, not all home remodeling projects deliver the same bang for the buck. Far from it, in fact. So which projects give you the biggest return on investment these days? This year (like last), the No. 1 finisher was garage-door replacement. While not as fabulous as a full-kitchen remodel, this project essentially pays for itself, earning you a whopping 97.5% of your money back. For this report, now in its 32nd year, researchers analyzed 22 popular home improvements in 136 markets nationwide. The magazine polled contractors on how much they charge for these jobs, as well as real estate agents on how much they think these features would boost a home’s market price. They then used those figures to calculate what percentage of its cost each project might recoup—or not. As it turns out, the price of a few key projects skyrocketed from the last year, while their value dropped, says Clayton DeKorne, chief editor of the JLC Group (which includes Remodeling magazine) and manager of the report. In other words, Americans might spend more on certain renovations and get back a lot less of the money they spent. According to DeKorne, President Donald Trump’s new import tariffs on steel, lumber, and other building materials are destined to jack up renovation costs all round, leading to thinner margins on their return. Plus, as the housing market wobbles towards a peak in market prices, homeowners are less likely to renovate their homes, and real estate professionals predict that the renovation market will tighten. 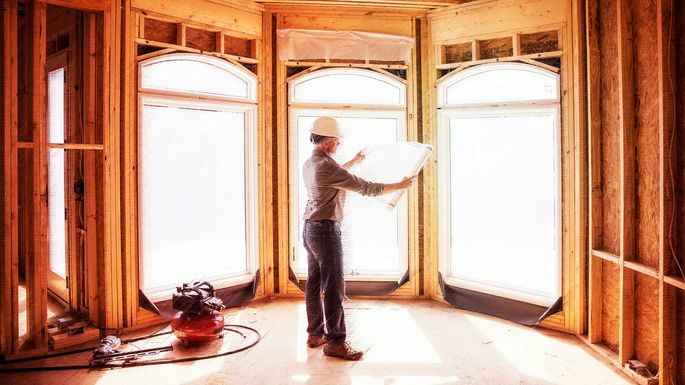 Overall, the report found that in 2019, Americans should expect to make back 66.1% of the money they spend on renovations—a slight bump from last year’s 65.8%. And the report found that for some projects, the ROI is really worth it, especially those improvements that the whole neighborhood can see—in front of your house. 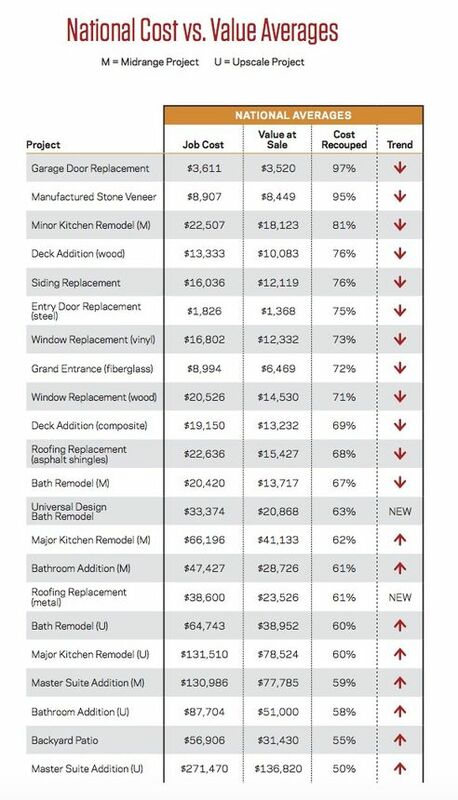 The chart below gives a full rundown of the top renovations, including how much they cost, their value at resale, and the percentage that can be recouped. After garage doors, the top finisher was manufactured stone veneer, with a 94.9% return on investment. Glamorous? No. Valuable? You bet. A new project on the list this year speaks to another decidedly unsexy but invaluable trend: installing metal roofing. Compared with asphalt shingles, metal roofing costs significantly more, but offers much greater durability. And while metal roofs only yield a 60.9% ROI, DeKorne predicts their value will increase. And if you’re absolutely dying to renovate something indoors this year, DeKorne suggests keeping it in the kitchen. While most of the projects with the highest returns are exterior replacements, a minor kitchen repair cracks the top 10, with an 80.5% recoup. “When buyers are looking at a house, they want to know the kitchen is something they can live with,” says DeKorne. A look at return on investment for popular home renovations. By: Allison Underhill is an editorial assistant at realtor.com. She previously wrote for Health.com, U.S. News and World Report, and Huffington Post.